When you decide to have your website designed by Compnix Hosting, you will have a wealth of experience behind you. Your website will be amongst over 600 other successfully designed and marketed, cost-effective websites that we have designed for other businesses ranging from sandwich shops through to massive 4,500 page governmental projects. Our website design team will work with you personally to assure an end product that is right for you and your budget. We even have the facility for you to design your own website (See Web Builder). On every project we take the time that is needed to give you the results you desire. It is because of this that we are able to form a valuable, long-term relationship with you to help you get the most effective use of your new website. Compnix's entry level package is ideal for you if you have a lower budget but still require that professional finish. We can produce an eight page website including an active front page to your website which also includes hosting for a year, a .co.uk domain, search engine submission and. even a webilizer hit counter and we do it on a pay per month scheme. For more details, just go to our Prices on the Site Design Web Page. If you are looking for a website with your corporate identity or to tie in with an existing brochure or leaflet, then we can customise a website for you and if required can design a brochure and website simultaneously to work in harmony (See Branding). As each site is totally unique we can only give a quotation once we have discussed your full requirements. Contact Us to discuss details. After the initial design period you can have the website updated as much as you require as the business grows or more product expansion is required to suit your needs. This could be on an adhoc pay as you go arrangement or on a pre-agreed monthly update maintenance basis, dependent on the time and complexity requirement. If you have already currently got a site and require your own IP and control system that need regular updating we can assist you to move your domain across to our hosting facility. We are doing this internationally for clients in countries both here and abroad. After we design your website, we take pride in maintaining it. We provide all aspects of site maintenance, from daily text and image changes, to improving search engine optimization, to full website redesigns. Have a quick look at some of our example websites. 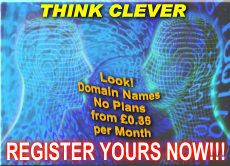 All of our prices include domain name registration and web hosting for one year. As a guide for you we have outlined some approximate prices below. For an idea of how how much your project may cost please contact us, under no obligation. as little as Â£4.99/mth to design and set up but being dependent on the complexity of design critera. If you need to store a lot of information and provide search facilities to your users, a database driven site may be required. A good example would be a property agency who would be able to add/edit/delete properties at will from a database that would also enable front end users to search the database for a property by area, location, price. We have designed database driven sites for as little as GBP 300.00, however due to the nature of this type of site please contact us for a quote. E-Commerce websites, or online shops, cost slightly more due to the complexity of the programming. They require a database to store the products and the facility to process payments online through services like Worldpay or Paypal. Our custom company branded logo designs costs vary dependent on the complexity of the intial design.